I am funded through several projects from the German Research Foundation (DFG). My position is financed through a Heisenberg Fellowship from the DFG. 2011: Young Investigator teaching prize, Faculty of Biology, Philipps University Marburg. 2008: Young Investigator teaching prize, Faculty of Biology, Philipps University Marburg. Reviewer for following Journals (selection): Cellular Microbiology, Infection and Immunity, International Journal for Medical Microbiology, International Journal for Parasitology, Molecular Informatics, Molecular Microbiology, Molecular and Biochemical Parasitology, Malaria Journal, PLS ONE, PLOS Pathogens, Nature Chemical Biology, Nature Communications, Trends in Parasitology, Traffic. Grant reviewing: Medical Research Council (MRC, UK), Wellcome Trust, (UK), NRF, (South Africa), SNF (Switzerland), German Research Foundation (DFG), ANR (France), Studienstiftung des deutschen Volkes (Germany). Dr. Przyborski joined our unit on 1 Oct. 2017 on the basis of the prestigious Heisenberg Fellowship being awarded to him. 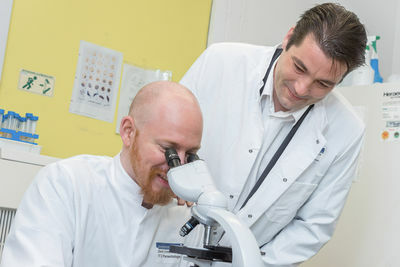 This 3-year fellowship by the German Research Foundation gives early career researchers who meet the requirements for professorship the opportunity to pursue an advanced research topic prior to professorial appointment. For further info see our news section.